Houghton Mifflin Harcourt, 9780544558168, 272pp. 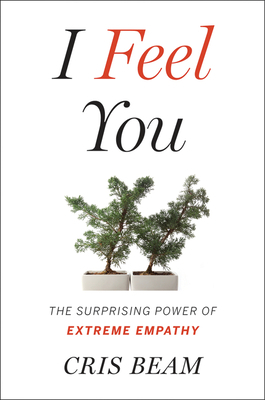 In I Feel You, Cris Beam carves through the noise with a revelatory exploration of how we perform empathy, how it is learned, what it can do—indeed, what empathy is in the first place. She takes us to the labs where the neural networks of compassion are being mapped, and the classrooms where children are being trained to see others’ views. Beam visits courtrooms and prisons, asking how empathy might transform our justice system. She travels to places wracked by oppression and genocide, where reconciliation seems impossible, to report on efforts to heal society’s deepest wounds through human connection. And finally, she turns to how we, as individuals, can foster compassion for ourselves. Brimming with the sensitive and nuanced storytelling that has made Beam one of our most respected journalists, I Feel You is an eye-opening affirmation of empathy’s potential. Cris Beam is the author of several award-winning books, including To The End of June: The Intimate Life of American Foster Care, and Transparent: Love, Family and Living the T with Transgender Teenagers. Her journalism has been featured in several national magazines and on public radio. Beam teaches creative writing at Columbia, NYU, and Bayview Women's Correctional Facility and lives in New York City.